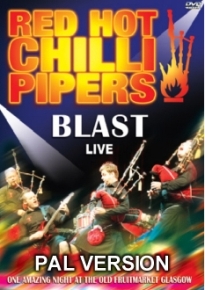 Recorded at Glasgow's Old Fruitmarket,BLAST Live! features tracks including their amazing version of Coldplay’s Clocks, a rocked up Highland Cathedral and We Will Rock You complete with brass section and Red HOT rock chick highland dancers! The CD version also includes brand new studio tracks including a Xmas Tune to contend the No 1 spot and a truly mesmerising re working of Massive Attack's 'Teardrop'.